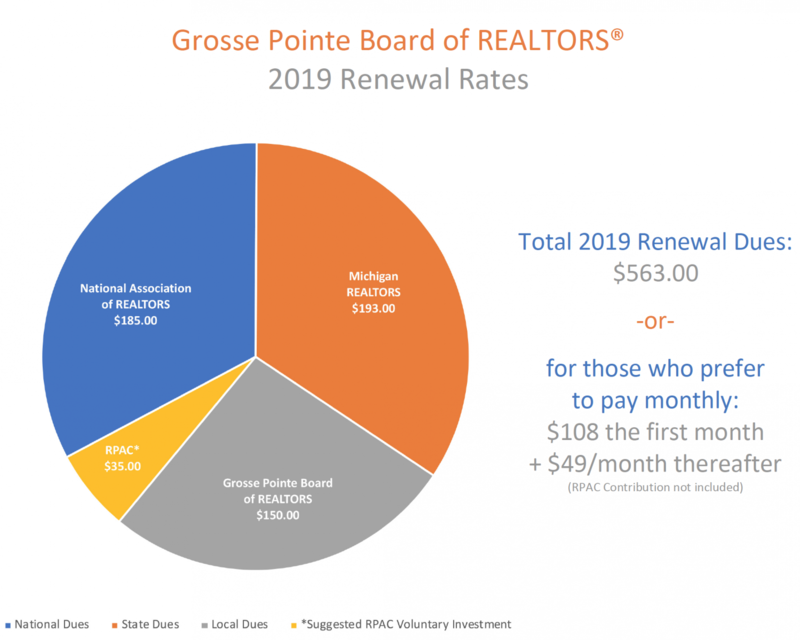 Current Members: 2019 dues renewal orders were sent to the following members on October 2, 2018: Primary Realtors® (annual pay), Secondary Realtors®, Affiliates and Gateway Members. Members currently enrolled in the Installment Payment Program (IPP) for monthly billing will automatically continue unless a request to transition back to annual billing is submitted in writing to the board office by October 8, 2018. If you did not receive an electronic notice of your 2019 dues renewal order, you are encouraged to contact the board office so we can verify the information we have on record is correct, however you will find all of the same information on this page. Please note: You will NOT receive a hard copy of your renewal order in the mail. Scroll down for a link to access your online dues order as well as answers to Frequently Asked Questions. New Members: Click here for information about our membership application process. Password: Password1 (for first time users) or the password you created last year. Once logged in, go to My Profile, click on My Transactions and your dues bill should be displayed. Click View More if you'd like to see a copy of the invoice before proceeding. Otherwise, click on the button that says Pay Open Orders. Follow the prompts to pay by credit card. Paying by credit card is secure, convenient, and instant. There is NO transaction fee for dues payments. 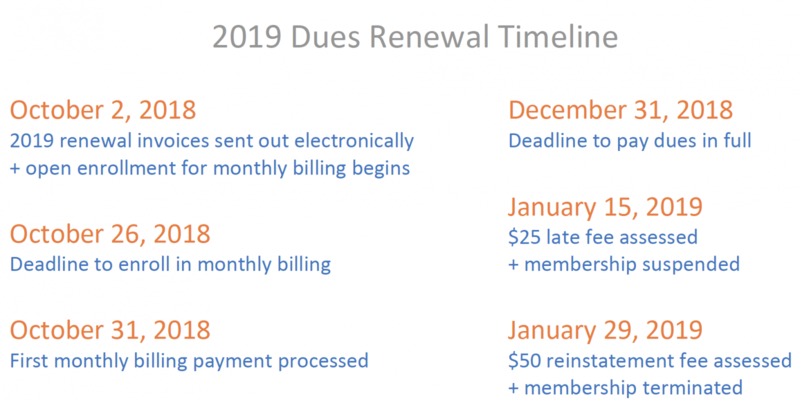 MONTHLY BILLING OPTION: Members who wish to enroll in the Installment Payment Program (IPP) for their 2019 dues renewal should CLICK HERE. Please be aware that there is an earlier due date for payment and related paperwork to enroll in the IPP. The deadline for enrollment is 10/26/18. Find answers to Frequently Asked Questions below. The most common questions are addressed in the FAQ. If you have a question that is not answered below, please call the board office at 313-882-8000. October 26, 2018 - Deadline to enroll in Installment Payment Program (IPP). CLICK HERE for IPP enrollment information. December 31, 2018 - Deadline for payment of dues in full. January 14, 2019 - Grace Period ends, final day to pay without penalty. January 15, 2019 - Unpaid members suspended & removed from MLS, $25 late fee applied to all payments. January 29, 2019 - Unpaid members are terminated, $50-dollar re-instatement fee assessed (in addition to $25 late fee). Your login is your email address on file with NRDS. The list we use for Broker Opens and News is a different mailing list and while the email addresses SHOULD be the same, that's not always the case. If you are not sure which email address we have on file for you, you can look yourself up in our online directory. If you used our online system last year, you created a unique password. We cannot retreive it, but you can click on the "Forgot Password" link to reset it. If you are a first time user of our online payment site, your password by default is Password1 (case sensitive, P must be capitalized). You will be prompted to create a unique password the first time you login. If the amount you are billed deviates from what's listed above, please call the board office so we can make sure it's correct before you pay. Please note: there is an earlier due date for payment and related paperwork to enroll in the IPP. The deadline for IPP enrollment is October 26, 2018. No printed invoices will be mailed to members, everything will be done online. If you wish to print an invoice you can do so by logging in to the payment system using the link above, then navigating to My Profile -> My Transactions and clicking on the "View More" link to bring up an invoice. Why should I pay online? Is it safe? Are there extra fees? Paying online is the easiest & quickest way to handle your dues payment. It will save you the trouble of writing a check or mailing a payment. Your payment can be processed immediately and you can pay at any time before the due date. Our credit card processor is secure and safe and we strongly encourage everyone to pay online with a credit card. There is never a credit card transaction fee charged by the board for dues payments. Please note: IPP participants are NOT eligible to pay dues online via credit card. The only accepted form of payment for IPP participants is ACH debit from a checking account. Can I pay on realtor.org or NAR.realtor? Our new payment system replaces the realtor.org (now NAR.realtor) payment site. You will not be able to view your dues bill if you go to realtor.org or NAR.realtor. Please use the link above to access your account. RPAC is the Realtor Political Action Committee, which is like business insurance in that it supports candidates and issues critical to your ability to do your job. While voluntary, the suggested minimum is less than 3-dollars a month and is your way of supporting your industry. Additional information on RPAC can be found here. Why is RPAC showing up on my bill even though I opted out? I am being overcharged. Don't worry, if you opted out of RPAC, you are not being charged for it. RPAC will be a list item in your shopping cart, but the "quantity" will say zero if you opted out, and it will not be added to your total. Please see the chart above to verify that you are paying the correct amount. My login didn't work so I made a new one, and I still can't see my dues order. Please DO NOT attempt to create a new login for yourself if you cannot login. You will create a duplicate entry in our database and the ID you create will NOT have your dues order attached. Creating a second login makes it more difficult for us to help you. If you can't login, please review the directions & FAQ, and then call us if you are still stuck. 313-882-8000, ext 2. I would still prefer to pay by check. If you are mailing your payment, please include a copy of your invoice (which can be printed when you login, or include a business card.) We strongly prefer a check or money order over cash, but if you must pay by cash, it must be for the exact amount as we cannot make change. My question isn't listed here and I still need help. Please call the board office during business hours at 313-882-8000, ext 2. Click HERE to download printable PDF copy.